I was so excited when this month’s Charcutepalooza project was announced. Out of all the projects we have had so far, this was one challenge I had a history with. I’ve been eating Canadian Bacon since I was 5 years old. When my family moved to Nashville in 1990, I was going to kindergarten and my dad had just moved his business here. We lived in a lovely townhouse in Antioch, TN, which was conveniently located next to a Domino’s Pizza. While most kids probably ate cheese, pepperoni, or sausage pizza, I always begged my parents to order Canadian bacon on mine. It was a smoky, flavorful addition to the otherwise glorious combination of bread, cheese, and sauce. Everytime I could bite into it, I was transported to my happy place. So this challenge was never about eggs benedict or hot smoking. It was really about making and understanding something that I have always adored. As these challenges start to come about, it is very interesting to see how the different techniques can be merged together to create a beautiful product. You can cure ingredients, like bacon, and then smoke them. 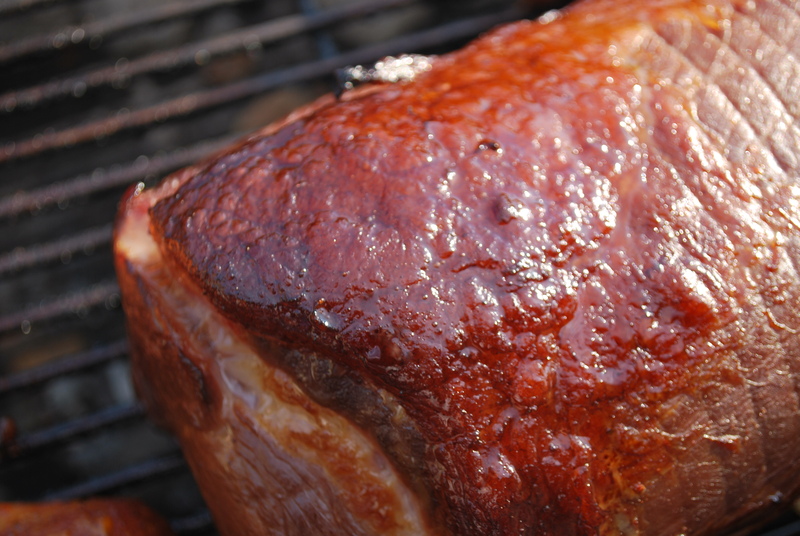 You can, in this case, brine a pork loin, and then smoke it to achieve Canadian bacon. These basic techniques of curing and brining seem to be omnipresent as the building blocks for charcuterie projects and I feel like I’m really getting the hang of this. Now smoking is something I’ve done before, but I’ve always had some trouble regulating temperature. See, I don’t have one of those big fancy smoking rigs or even an indoor smoker. I do, however, have my trusty Weber Kettle grill. I made it into a smoker, but lighting a very small amount of charcoal and then covering it with soaked hickory chips, to maintain an even low heat. I used to use as much charcoal as I did to grill, but that would make the temperature way too high, burning the food on the outside before it was cooked in the middle. 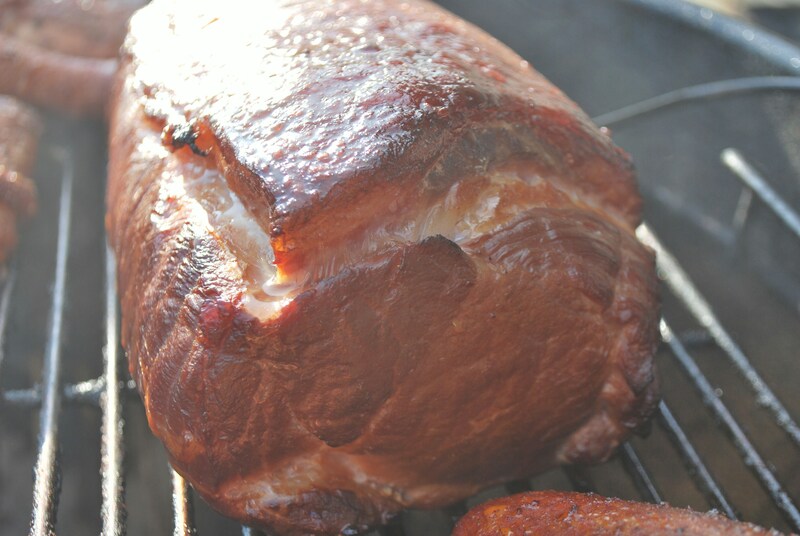 By using a very small amount of charcoal, I could maintain the temperature and the Canadian bacon came out even better than I expected. The idea for my recipe came about on a whim. I was actually on a trip to DC last week and I met up with my good friend and former coworker, Sarah. At lunch, I had a Thai chicken salad with this lovely peanut dressing. When I came back home, I found a container of freshly ground peanut butter. Immediately, I was inspired to recreate that salad – but to replace the chicken with some of my homemade Canadian bacon. The salad was an amazing combination of flavors and textures – the crunch cabbage and peanuts, the creamy dressing, the succulent pork, and freshness from the herbal mint and chives. It was a great dinner. Combine the vinegar, hot sauce, soy sauce, lime juice, ginger, peanut butter, and honey in a bowl and whisk to combine. Slowly stream in the olive oil and whisk until emulsified. Season with salt and pepper. Stir in the chives. Combine all of the ingredients in a bowl. Toss with enough dressing to just barely coat everything. Serve on a plate with some more of the peanut dressing. ← Japan Tsunami Relief Dinner with Top Chefs Tiffany Derry and Arnold Myint! Wow. I want to go there. 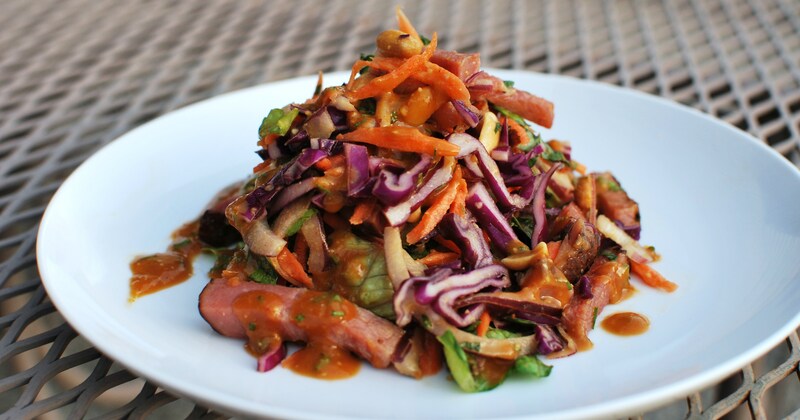 I LOVE Thai Peanut Salads and this is a great twist on one! Yum.